I have a My Friendship Bracelet Maker Clipboard and a My Lanyard Maker and the S hook on the My Lanyard Maker broke, so they sent me a new one with a coupon for 30% off anything else, so I bought a My Circle of Creativity. It was $29.99 and with the discount it was $21 with $4 shipping. I wanted to buy it before, but this 30% off coupon was an incentive to go ahead with the purchase. One reason why I bought the My Circle of Creativity instead of buying the round discs or boards at the craft store was because I wanted to buy a kit that had drawers in it like this does for storing supplies. Also because it spins and you could put the strings around these bobbins. From what I saw in the videos, you could probably make these bracelets really fast with 2 hands. You grab the top right bobbin with your right hand, the bottom left bobbin with your left hand, and move the right down, the left up and spin the disc and go to the next strands. At least I’m sure I will work up to being that fast eventually. I’m hoping to make several different things with this. It’s main purpose is to make the Kumihimo friendship bracelets, and I would like to make those, but I also want to take it a step further by making lanyards or shoe laces, or even perhaps making long ropes that I can use to make a belt with the flat friendship bracelet pattern. Wouldn’t that be interesting? I’m sure I could just buy some paracord, but I want to make specific patterns for each color. I think that will definitely make the belt a bit more interesting than any other belt you have in your closet. I may even decide to use the lanyard pattern and weave these ropes into dog leashes, hey I hadn’t thought of that, it just popped into my mind. Someone has asked for that, and now I think I will do that. See, there is inspiration everywhere. I will definitely have a lot of fun with this thing since I know I will be able to make many different things with it. And I really hope that it is fast, easy and fun and not boring at all. I do get bored easily. I’ve already been asked to make 3 bracelets for Breast Cancer Awareness month, and this is the perfect thing to make it with. I normally would use My Friendship Bracelet Maker Clipboard and make a flat bracelet, but I want to try making it with this pattern. I think it will look a lot nicer. I am even considering using beads with this pattern instead of just embroidery floss. I don’t have the beads, so perhaps next time, but I do want to make it with beads eventually. 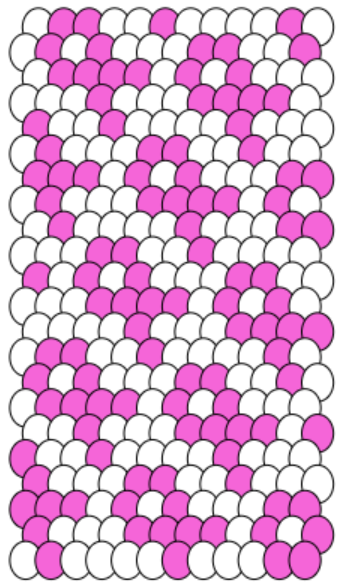 I can use this pattern for any of the awareness ribbon patterns, like using red for the ribbon for AIDS awareness. Anyway, I will be getting this new gadget soon and I cannot wait to make the first Kumihimo bracelet with it. As with any craft item I make, it will probably take a few or more bracelets before I am good at it. Everything takes practice, and practice makes perfect, so wish me some luck.